Hazelnuts are not only a delicious snack, but they provide a range of nutritional benefits, including a high content of protein, healthy fats, and vitamins and minerals. Including a handful of hazelnuts in your diet may help to improve the health of your heart by lowering blood pressure, reducing inflammation and managing your cholesterol levels. 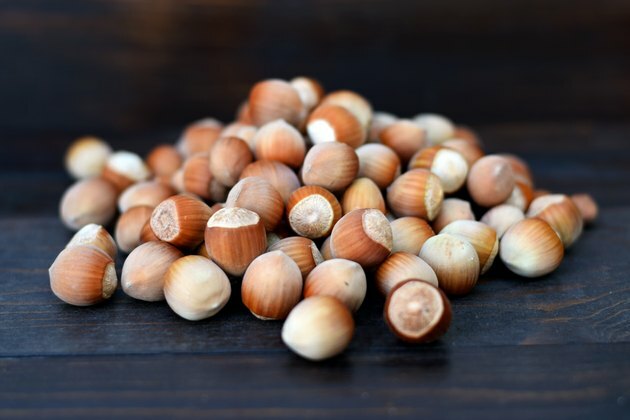 Hazelnuts provide a multitude of healthy benefits, not just in nutritional content, but in their role of helping to prevent or manage illness and some medical conditions. Grown all over Europe, Asia and North America, hazelnuts are from trees and shrubs in the Corylus genus. Also known as filberts, they're slightly smaller than an acorn and have a thick, smooth, hard brown shell, but are most commonly sold shelled. The sweet-tasting, cream-colored kernel is small and round, with a thin, dark-brown skin that some people like to remove before eating. Hazelnuts are good eaten raw, but are more flavorful and sweet when roasted. Because of their high fat content, hazelnuts should be stored in the fridge. Hazelnuts are a healthy snack because they don't contain cholesterol or sodium and are low in natural sugar. A handful of hazelnuts, or 10 nuts, contains 88 calories and 2.3 grams of carbohydrates. Low-carb diets have been found to increase energy expenditure during weight-loss maintenance and may be useful in improving the treatment of obesity, according to a 2018 study published in BMJ. The total fat content of 10 hazelnuts is 8.5 grams, which represents about 13 percent of your daily value (DV). Fats are an important part of a balanced diet and help your body absorb nutrients. Dietary Guidelines for Americans recommends that 25 to 35 percent of your daily calories come from fat. Although hazelnuts contribute 3 percent DV for saturated fat, they're a good source of monounsaturated fats — 6.4 grams — and polyunsaturated fat — 1.1 grams per handful. Monounsaturated and polyunsaturated fats have a beneficial effect on your heart by lowering the bad cholesterol levels in your blood. The omega-3 and omega-6 fatty acids in hazelnuts are important components of cell membranes and are involved in the regulation of inflammation and prevention of hypertension. A major type of monounsaturated fat in hazelnuts is oleic acid. Oleic acid has beneficial effects on your health and may have a positive role in reducing cholesterol levels and blood pressure. Hazelnuts contain 2.1 grams of fiber, which accounts for 4 percent of your daily value in just 10 nuts. Dietary fiber, also known as bulk or roughage, is important to encourage regular bowel movements. Dietary Guidelines recommends a daily intake of 25.2 grams for women age 31 to 50, and 30.8 grams for men in the same age group. The insoluble type of fiber in hazelnuts has many health benefits beyond the health of your digestive system. Fiber can help you maintain a healthy weight by making you feel fuller so you eat less. In addition, fiber may lower your risk of diabetes, heart disease and some types of cancer, according to Mayo Clinic. Another health benefit of nuts, including hazelnuts, is their rich source of vitamin E. One handful of hazelnuts contains 2.1 milligrams, or 7 percent of your DV, of vitamin E. Vitamin E is necessary for your immune system and healthy skin and eyes. Read more: What Does Vitamin E Do for the Body? Hazelnuts are also a good source of B vitamins, especially thiamine — for proper nerve, muscle and heart function — providing 6 percent DV per 10 nuts. Vitamin B6 is important for brain function, and hazelnuts provide 4 percent DV in a serving. Other B vitamins in hazelnuts include niacin, pantothenic acid and riboflavin. Hazelnuts also contain vitamin K, for blood clotting, and vitamin C, an antioxidant important for your immune system. Manganese is a star mineral in hazelnuts. Just one handful delivers 0.87 milligram or 43 percent of the recommended daily value for manganese. Manganese is known to have antioxidant functions and is responsible for normal metabolism of amino acids, fats and carbohydrates. Hazelnuts are also high in copper content — providing 12 percent DV — which is essential for normal cardiovascular function. A copper deficiency causes an increase in blood pressure and cholesterol levels. Results of a study published in the journal of Clinical Nutrition Research in 2015 found that both copper and manganese intake were shown to have a positive effect on lowering blood pressure in 640 participants. Other minerals in hazelnuts include iron, zinc, magnesium, calcium, phosphorus and potassium. All nuts, including hazelnuts, contain a component called phytic acid that serves as the main storage form of phosphorus. As a percentage of dry weight, hazelnuts contain 0.2 to 0.9 percent phytic acid. Phytic acid is known to impair the absorption of iron, zinc, magnesium and calcium, which may promote mineral deficiencies. If you follow a balanced diet, this is normally not a concern. However, if you have a mineral deficiency, such as zinc or iron, limiting the intake of high phytic-acid containing foods is advised by the GI Society. Although phytic acid decreases mineral absorption, it also has anti-cancer health benefits as a result of its antioxidant properties. Research has shown that phytic acid may inhibit the growth of cancer cells. In addition, hazelnut's high concentration of antioxidants in vitamin E has been linked to cancer therapy. A study showed that vitamin E isoforms demonstrated a therapeutic effect against some cancer types, including breast, prostate and colon cancers, as published in the AAPS Journal in 2015. The manganese content in hazelnuts may be also be helpful as an anti-cancer compound. A study, published in the International Journal of Clinical and Experimental Medicine in 2015, found that a deficiency in manganese is associated with an increased risk of breast cancer, although further research is necessary. A test-tube study published in Biomedicine and Pharmacotherapy in 2017 showed that hazelnut extract may have a potential benefit in the treatment of cervical and breast cancer. In addition, a study published in Anticancer Research in 2018 assessed the effect of the consumption of hazelnuts as a contributing factor to the avoidance of colon cancer. Findings were that in vitro fermented hazelnuts indicated a potential for the prevention of cancer. Furthermore, an eight-week animal study published in Food Chemistry in 2015 used a compound made from the skin of hazelnuts which resulted in a decreased risk of cardiovascular disease and colon cancer. The antioxidant properties and monounsaturated fatty acid content in hazelnuts may account for its positive effect on blood cholesterol levels. A review of nine studies, with over 400 people, analyzed hazelnuts and determined that diets enriched with hazelnuts are associated with a decrease of LDL and total cholesterol, as published in the journal Nutrients. Moreover, the high content of fatty acids, antioxidants, dietary fiber, potassium and magnesium in hazelnuts may help normalize blood pressure. A study examined 21 controlled trials to assess the effect nut consumption had on systolic and diastolic levels. The results, published in the American Journal of Clinical Nutrition in 2015, found that hazelnut and other nut consumption led to a significant reduction in systolic blood pressure levels in participants without Type 2 diabetes. The majority of the antioxidants present in hazelnuts are concentrated in the skin. Antioxidants are principal players in protecting your body from oxidative stress which is linked to aging and chronic disease. The most abundant antioxidants in hazelnuts are phenolic compounds. A 2016 review by the Research Center for Food and Development in Mexico suggests that dietary phenolic compounds may be associated with a lower incidence of chronic degenerative diseases, such as cancer, diabetes, Alzheimer's disease and cardiovascular diseases. Read more: How Much Antioxidants in a Day?